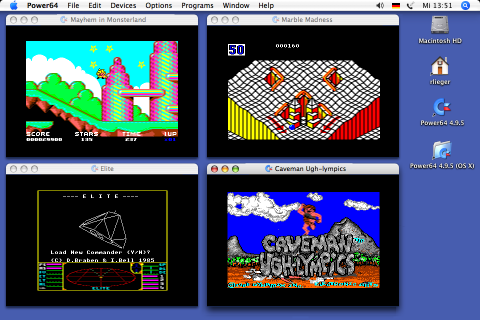 Enjoy your favorite Commodore64 games on your Apple Macintosh! Power64 is an emulator for the Commodore C64. It allows you to run your favorite C64 software on your Apple Macintosh (with PowerPC or intel-CPU (with Rosetta)) at full speed with smooth graphics and great sound. Interface to the reSID Library by Dag Lem, that offers almost 100% precise SID Emulation (incl. Filters, Resonance). CPU Level 1541 Floppy Disk Emulation using *.D64 and *.G41 (GCR) disks. Can handle most fast-loaders and special floppy tricks. ROM Level 1541 Disk Drive Emulation (*.D64, *.X64 and ZipCode files supported) for fast and easy disk access. 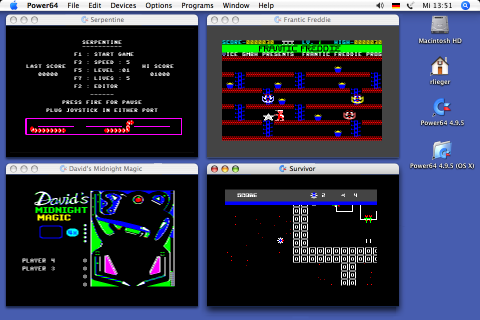 ROM Level 1571 and 1581 Disk Drive Emulation (*.D71, *.D81) for fast and easy disk access to large disks. 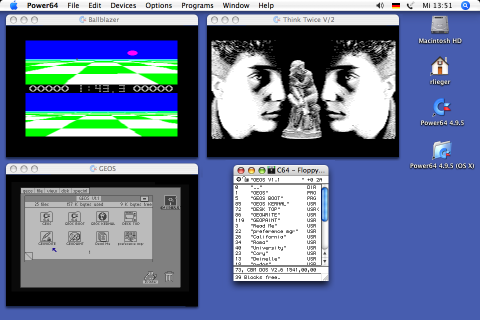 Direct Access to Macintosh File System (both *.C64 and *.P00 files supported). 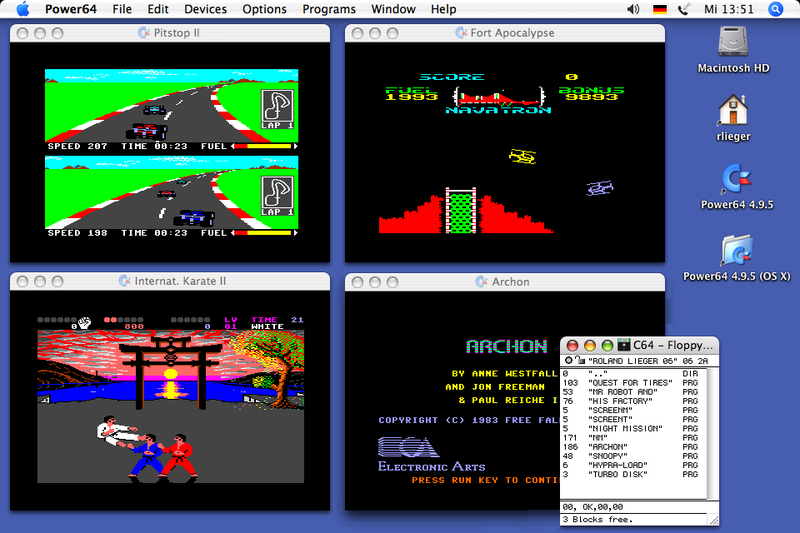 Even ZIP-archives with collections of *.C64 and *.P00 files can easily be used just like a folder on a harddisk. Automatic expansion of ZIP, GZ and LHA compressed Disk or Tape images. No need to expand compressed images from CD-ROM to harddisk. Just run them from the CD. Power64 can also write GZ files, saving space on the Mac HD. Support for OpenGL for smooth C64 windows of arbitrary size with perfect filtering. Screen dialogs and full documentation is available in English, German, Spanish and (dialogs only) French. 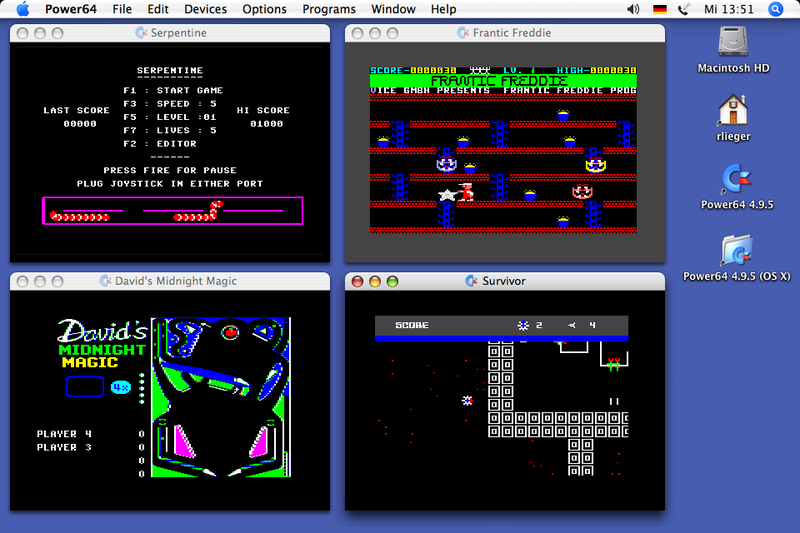 Built in Monitor/Debugger for an inside view of C64 code. Display the current C64 keyboard layout on the screen to find graphics characters quickly. Cut & Paste makes it easy to 'type' long listings into the C64. Simply extend Power64 to load all your "essential" programs with a single click of your mouse. Is Shareware! You can download your free copy from this site. Power64 is fully functional, and that you can test it with your favorite games, but it is restricted to 10 minutes per session until you register. Power64 supports 5 levels of antialiasing to emulate the blurr of a TV screen. Read the Power64 Documentation Online. The documentation is of course also included in the Power64 Download archives. of many popular games and useful tools running on Power64 are available here. Check that your favorite games are also included on the List of Compatible Games. There is also a long History of the Power64 Logo.